After reading your favorite Thanksgiving story you can have the students fill out the story map labeling the feathers. Fill in the title of the book, setting, characters, problem, solution, and author’s purpose. This is a fun and easy way to see if your students understand the story. 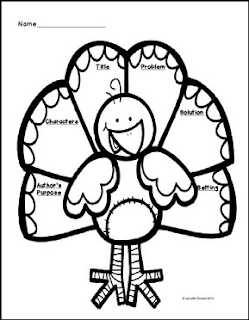 This activity can be found in my Thanksgiving Turkey Language Arts Unit. Make sure to provide feedback on every item you buy. Click on the Provide Feedbackbutton and give a rating and comment about the product you purchased. TPT gives a credit that you can use to lower the cost of future purchases. *Look for the green star near the top of any page within my store and click it to become a follower. You will then receive email updates about this store. I hope you enjoy this story map!